Max. drilling depth 75 mm. steel up to 56 HRC. ● Rotating helical groove to generate evacuation force to remove cutting chips. NC2032 : K20F, TiAlN coating. Design for high performance cutting, special good for cast iron and hardened material <HRC50°. NC5072 : P40, TiAlN coating. General purpose, suitable for almost all kind of steel, stainless steel and Titanium. 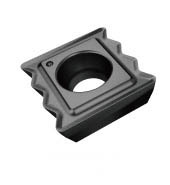 Recommended while clamping devices is weak or apply on low power machines or deep hole drilling.